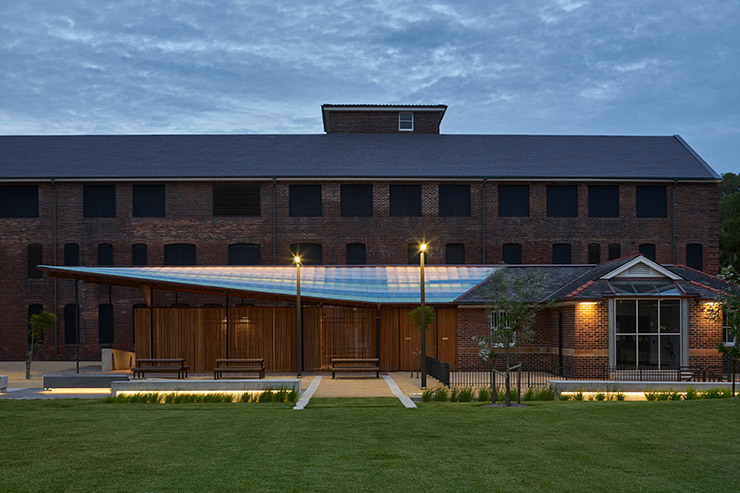 The regenerated Joynton Avenue Creative Centre and Banga Community Shed/ Amenities Building by Peter Stutchbury Architecture consist of two facing buildings which front the Matron Ruby Grant Park that lies in between. 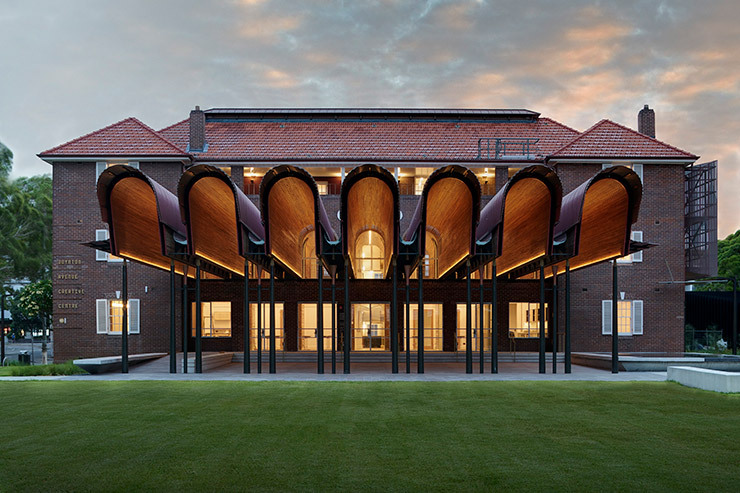 The Joynton Avenue Creative Centre takes centre stage on the site with its bold timber vault canopy frontage that extends into the building. Upon transfer to them in 2003, the City of Sydney recognised the opportunity to conserve and modernise the precinct by giving it a prominent community role within the expanding suburb of Green Square. The regeneration of the precinct accommodates artistic workshops, a gallery space, a community hire space, public amenities and creative offices. A strong commitment to the site’s history, for a new era of service to the Green Square community, has been made; the approach taken allows the operating block to remain relatively unaltered in form, configuration and detailing. The lighting design concept and installation follows this commitment in an unpretentiously simple and economic manner, whilst also respecting the tight budget constraints of this public building. 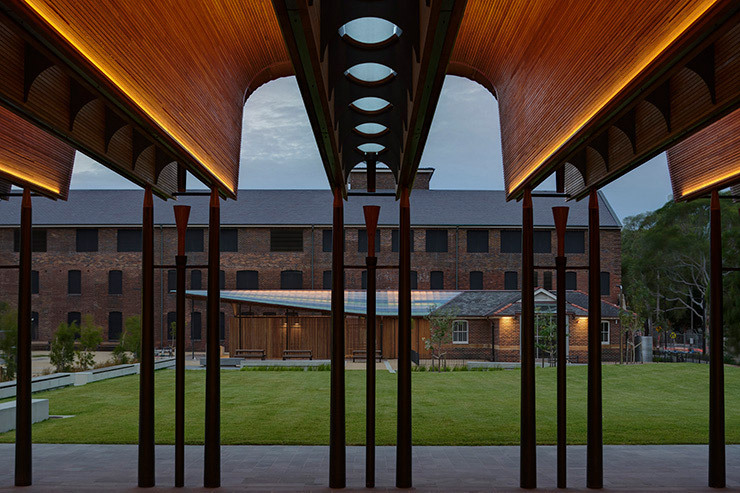 The lighting response to the external timber vaulted ceiling supports this bold and distinctive architectural statement, forming a key element in the building’s unique identity, providing a soft luminous canopy and maintaining minimal daytime visual impact. As a modest and simple community facility, a simple non-intelligent control system was requested that allowed an element of modulation to multi-use spaces and considered strategies to reduce energy consumption. Lighting has been designed to be visible and ‘honest’ without concealing cabling or mounting solutions. Luminaires have been selected for their robust and industrial appearance, where visibility of connections and lamps was desired rather than to be hidden. 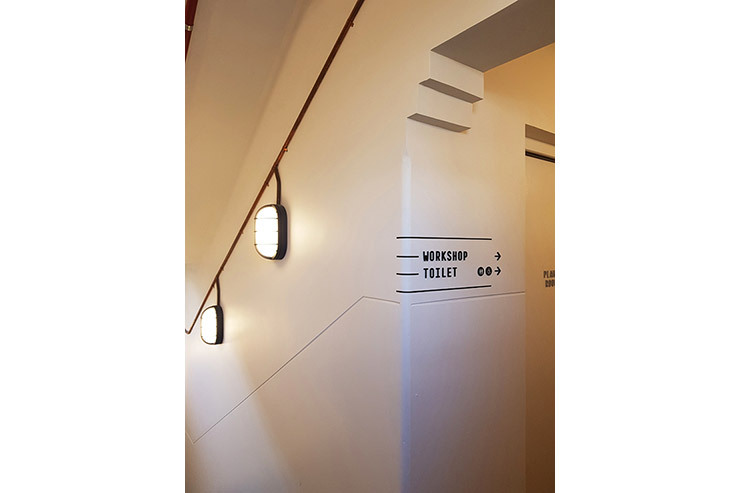 In the staircase, the prominence of the infrastructure was further enhanced through visibility of brass conduiting, creating an industrial design language that speaks to the history of the building. 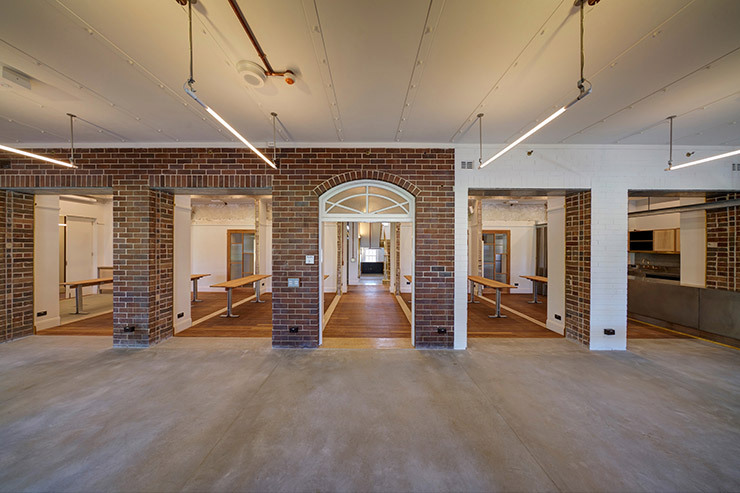 The use of modest ‘bare’ lamps, mounted with visible fixings ties in with the budget constraints on the project and works seamlessly with the materiality and conservation approach of the architecture. The lighting design becomes unique through its modesty and simplicity, also requiring minimal maintenance and operational training. 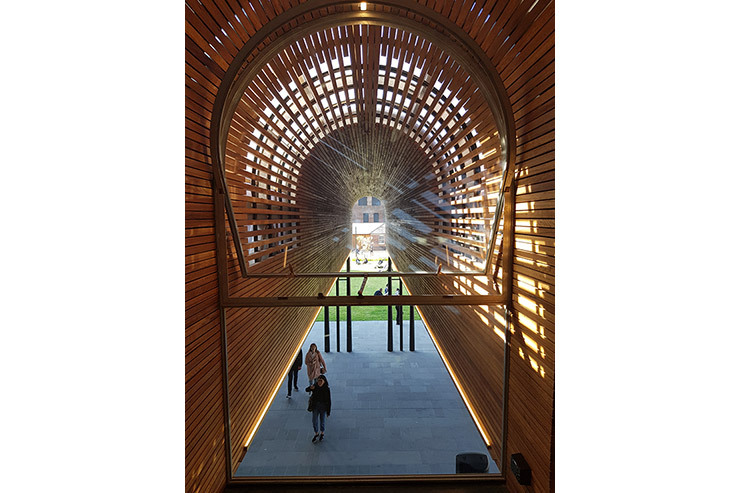 At the same time, the key feature of the building, the curved timber vaults at the entrance are dramatically enhanced through lighting to accentuate form and create a unique and distinct identity and entrance into the community facility. The building has minimal impact on the environment. It is naturally lit during opening hours and mounting of luminaires considers simple operation and maintenance approaches. Without an intelligent lighting control system, local zoned control allows users to adapt their work environment to suit task requirements and daylighting conditions. An element of automation was incorporated to turn all building lighting off after hours. Creating spaces for people that are useable, welcoming and comfortable was part of the philosophy to instil a sense of ownership and encourage users to connect with and participate in the control of the building.